This is an excerpt from FallProof! Second Edition by Debra J. Rose. The exercises presented in this section are designed to help your clients maintain the flexibility needed to perform many basic and instrumental activities of daily living. Just a few examples of the types of daily activities that require good levels of flexibility in the neck, shoulders, and trunk include combing or brushing one’s hair, reaching for objects on the upper shelves of a closet, and turning to check that a lane is clear when driving. The chin-to-chest stretch targets the muscles in the back of the neck. a. Sit tall with the lower back pressed firmly against the backrest of a chair. Keep the shoulders relaxed and the chin tucked in so that the ears are directly above the shoulders. The eyes should be focused on a target directly ahead and at eye level. Inhale. b. Slowly tuck the chin toward the chest while exhaling (figure 9.1). c. Hold the position for 5 to 10 seconds while breathing evenly. d. Inhale and raise the head back to the starting position, one vertebra at a time. 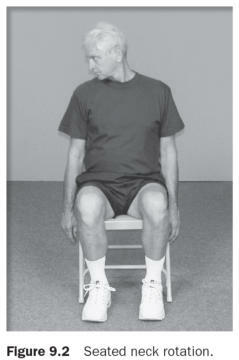 e. For an added balance challenge, perform the exercise while seated on a Dyna-Disc or balance ball. Neck rotations target the muscles in the back and sides of the neck. a. Sit tall with the lower back pressed firmly against the backrest of a chair. Keep the shoulders relaxed and the chin tucked in and gently resting on the chest. The eyes should be focused on a target directly ahead and at eye level. Inhale. b. With the head in a comfortable position and the chin gently tucked in, slowly turn the chin up toward the right shoulder (figure 9.2), then back across the chest and up toward the left shoulder. Exhale during the rotation. c. Keep the chin in contact with the chest throughout the rotation. d. Repeat the exercise 3 to 5 times. 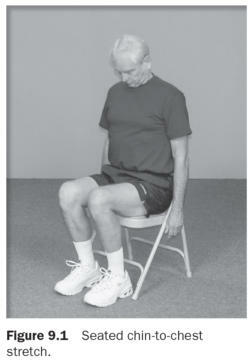 e. For an added balance challenge, perform the exercise while seated on a Dyna-Disc or balance ball or while standing behind a chair.